We are Central Carolinas Animal Hospital in Rock Hill, SC ... and we're here to serve you! The staff members of Central Carolinas Animal Hospital have been hand-picked by Dr. LePardo for their skills and their dedication to animal health. She is confident of their ability to provide excellent health care services for your family pets, and treat them like members of their own families. Britt was born in Alabama and spent most of her childhood relocating around the United States, until finally settling in Rock Hill, South Carolina. Britt joined the CCAH family in July of 2018. Over the last 18 years she has worked in the veterinary field in both private practice and laboratory animal medicine. 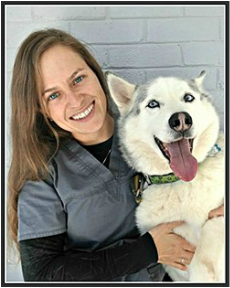 She is a certified Laboratory Animal Technician and used her skills to provide anesthesia and pain management for laboratory patients, ensuring the best possible care available. Although the laboratory technician experience was rewarding, she finds the private practice setting more rewarding, focusing on the fast-paced environment, the variety of tasks performed with each patient visit, and making a positive difference in the lives of not only animals but their owners. Her special veterinary interests are surgery & anesthesia, client education and staff training. Although work keeps Britt quite busy, she has a variety of interests that help her with her work-life balance including watching her nephew play sports, fishing, home projects, and target shooting. She has a four-legged child named Bella (a Cocker Spaniel/Yorkie mix). Blaire is originally from Wisconsin where her love for animals began while living on a farm for the first 6 years of her life. She and her family then relocated to Charlotte metro area where she was raised. Blaire Earhart has 14 years of experience working in the animal industry, including grooming and has spent 12 of those years as a veterinary receptionist and assistant. Blaire is an outdoor enthusiast and spends as much time as possible on the water kayaking or paddle boarding. She is also an amateur artist passes her time drawing and enjoys crafting. She currently lives in Fort Mill with her daughter Makayla, 5 dogs (Mya, Elliott, Nano, Rocket, and Max), and 2 cats (Henry and Lily). Karolin Eichler is a Veterinary Assistant and an avid outdoor enthusiast who currently lives on a small farm in the Rock Hill area with her 4 dogs (Baker, Cricket, Rita and Nora) and her two horses Blue and Phin. Karolin has her undergraduate degree in therapeutic equine assisted related studies and a graduate degree in mental health counseling. 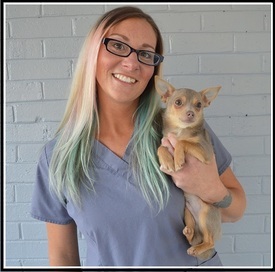 Karolin worked as a veterinary assistant for over two years while completing her graduate studies and is currently employed full-time in the Charlotte area as a substance abuse and mental health counselor. She has held this position for more than 3 years. She has returned to work part-time in the veterinary field because being around animals is her own form of therapy in coping better with life and stress. Justine Smith comes to us from New York City, where she lived for the first 24 years of her life. She attended the Ballet School of New York on a full scholarship as a child and even performed on stage with Gregory Hines at 8 years of age. Upon graduating high school, she worked as a model for many well-known designers and brands. She also has a background in real estate. Her love for her animals has brought her down south in search of a quieter life, as her dogs did not appreciate the hustle and bustle of the big city as much as she did. She is a huge animal lover with previous experience working at a veterinary clinic in New York, and she’s fostered and volunteered for numerous rescues including the Lab Rescue of NC. She currently lives in Rock Hill, SC, with her 2 labs, Molly and Wigglebutt and 6 cats Cuddy, Charlie, Squishy, Munchkin, Mowglie, and Irwin. She also has four corn snakes Suri, Saddler, Chloe, and Bella. One of her favorite places in the world is Grandfather Mountain. In her downtime she enjoys hiking, trips to the lake to feed the geese and interior design projects.